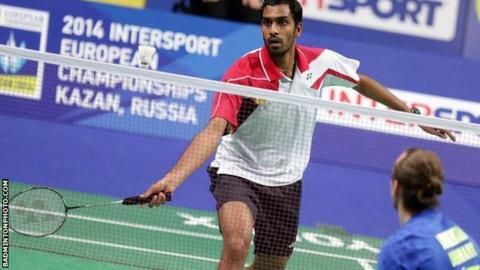 England's Rajiv Ouseph took silver at badminton's European Championships after losing to top seed Jan Jorgensen of Denmark in Kazan, Russia. Jorgensen won Sunday's final 21-18 21-10 to end Ouseph's hopes of becoming England's first male European singles champion for 24 years. Ouseph, who won a European bronze four years ago, reeled off nine points in a row to lead 13-8 in the first game. However Jorgensen hit back to win it in 16 minutes and dominated thereafter. The Dane finally added European gold after previously winning silver and bronze medals. Ouseph, 27, adds individual silver to the the same medal that he won at the European Team Championships in February. The Londoner will be looking to take his form into the three big tournaments over the next four months - the Thomas Cup finals in Delhi, the Commonwealth Games in Glasgow and the World Championships in Copenhagen.